September 1, 2016 - Exchange Bank of Missouri has announced that Slater High School Junior Larenz Moore has been selected as the first SHS Exchange Bank of Missouri AAA Award winner. Moore was selected due to his effort and excellence in Academics, Athletics, and Activities. "We're proud of Larenz and the work he's done in his time at Slater," said Slater High School Principal Jessica Clements. "He is an all-around great young man with a tremendous amount of success in his future." 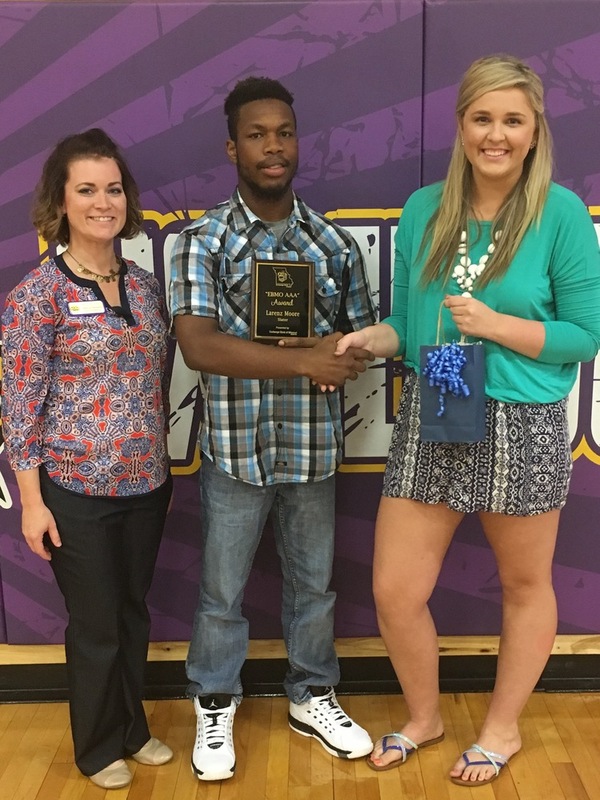 On hand to present the award to Larenz was Mickayla Spaulding of Exchange Bank of Missouri. Pictured above (L to R) is Slater High School Principal Jessica Clements, Larenz Moore, and Mickayla Spaulding of Exchange Bank. Larenz is the son of Jasmine Moore.